Fully integrated dishwashers are designed to be hidden behind your full height furniture door matching the rest of your kitchen. They require a plinth to run across the base of the dishwasher allowing you to maintain a seamless look in your kitchen. Fully integrated dishwashers have the controls hidden on the top of the door so they are only visible when you open it, making them incredibly easy to operate. Some models even project the time remaining on to the floor to let you know when the cycle will finish, taking away the guesswork. 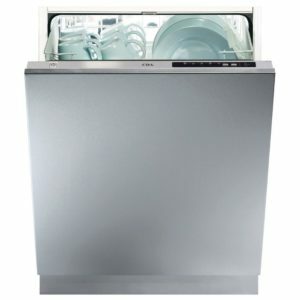 We’ve got some incredible dishwashers below from market-leading brands like Miele, Neff and Bosch. These models are available in the standard 60cm width or if you’re short of space a slim line 45cm version. Free 6 Months Supply Of Finish Powerball Tablets! This superb integrated dishwasher offers space for 13 place settings, which is plenty of room for a large family and you'll have 5 wash programmes to choose from too! It has an A++ energy rating and a low noise level of 49 decibels. Designed to seamlessly integrate into a fitted kitchen, this dishwasher puts you in control, letting you delay the time it gets to work by 3, 6 or 9 hours - great if you want to use it at night. Just a note, this unit requires a cold water feed and a waste outlet. 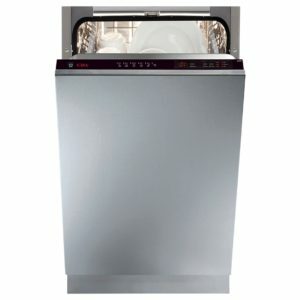 Feast like a king without the washing up with this superb integrated dishwasher from CDA. Offering 9 wash programmes and space for up to a whopping 15 place settings this is the perfect buy for the larger household. Not only does this model have an A+ energy rating but it's clever too. The intelligent sensor on this dishwasher allows just the right amount of water in to wash your dishes saving you water, energy and money! This model is designed to be completely hidden behind a cupboard door so it fits in effortlessly with the rest of your kitchen and requires a cold water feed and a waste outlet. 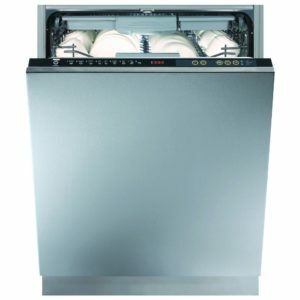 This superb integrated dishwasher from CDA offers space for 10 place settings and 6 wash programmes. It has an A++ energy rating and a 49 decibel noise level. This unit is designed to be completely hidden behind a furniture door and will require a cold water feed and a waste outlet.